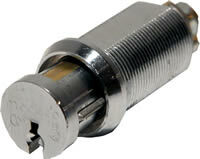 The standard Medeco cam lock provides patented key protection and UL listing. 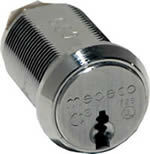 Medeco cam locks come in four different sizes and come with "Anti-Drill" steel pins at critical points in the lock face. 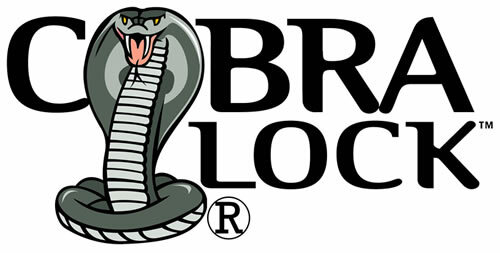 All Medeco locks use a double locking principle which renders the lock virtually pick-proof. Comes in six lengths 5/8", 7/8" 11/16" 1-1/8" 1-1/2" and 2"
The Removable Core Cam Lock by Medeco features a lock core that is removable. To remove the lock core you use a "Control Key" which is designed to take out the core. Once out a new lock core with a new key code can be inserted the same way. All of this can be done with the lock mounted by the end user. When the lock core is removed the shell remains. The Medeco MVP cam lock provides key control and protection in an economical design. The shell and lock plug are made of high density die-cast metal. This lock comes in two different sizes. When key control is the main concern, the MVP is an outstanding value. The Medeco DuraCam cam locks were designed so that the key would be virtually unbreakable. DuraCam locks have a new "sideways" key that provides extreme resistance to breakage. The key and keyway is under U.S. patent protection. Two different sizes are available 5/8" and 1 1/8"